Here’s a small Mombasa travel guide, covering the major tourist destinations and some practical travel tips. 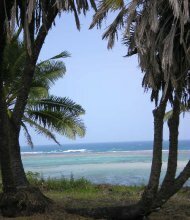 Most people use Mombasa as an entry point for the Indian Ocean beaches. But Mombasa, and the area around it, have much more to offer than just sun and sand. The beaches north and south of Mombasa are of the archetypical tropical quality: soft white sand, with palm and coconut trees. There are some good resorts along the coast in all price categories. The area also gives excellent opportunities for scuba diving and snorkeling (there are beautiful coral reefs a few miles from the coast), and other water sports. Go to my separate section about Kenya’s beaches here. You simply can't visit Mombasa and not take a tour around the old Fort Jesus. The fort was built in 1593 by Portuguese colonists, though it changed hands many times over the years. Much of the original structure is still there to enjoy, though the British did do quite a bit of reconstruction when they turned the complex into a prison in the late 1800s. The attached museum is filled with artifacts from the Fort, as well as from other historic areas around Mombasa. 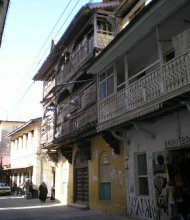 This is the historic centre of Mombasa, and right next door to Fort Jesus. Take a walk through the Old Town community and see houses and other buildings from the Arabic, Asian, African and European worlds. Like the whole coast region, Mombasa was invaded time after time by Arab, European and other peoples, and this has produced a rich and diverse architecture and history. Walking guides are available to help you find your way around. Your Mombasa travel guide continues with one of the major safari destinations, and not too far from the city. The pair of Tsavo East and Tsavo West National Parks are the largest in Kenya and will provide you with the classic safari experience. You can drive the Bachuma gate of Tsavo East, which is about 100km away from Mombasa. Since most roads are bad to terrible, you will need half a day to bridge this distance, however. A lot of African wildlife can be spotted here, including elephants, lions and giraffes – read more on my Tsavo East and Tsavo West pages. Ok, you still want more wildlife in your holiday? Head north from the city, along the north coast to Bamburi for a walk through the trails and conservation areas there. The Bamburi Nature Trails have been built on old quarry land from the next-door cement factory. You will see giant tortoises, antelope and hippopotamuses in this lush forested reserve. It's a wonderful example of conservation and ethical use of land, especially since many of the animals here are orphaned, and the average Mombasa travel guide doesn't cover this one. Visiting a coastal city means you have to take in some of the marine life, and there is plenty to see at the nearby Malindi and Watamu Marine National Reserves. Like the Tsavo parks, this marine park is about 100km from the city, but northward this time. Luckily, accomodation in Mombasa is cheaper than in expensive Nairobi. North and south of Mombasa, there are dozens of beach resort and hotels located directly at the beaches, and the city also has enough accomodation. There are choices for each budget. Here are my favorite city and beach hotels in Mombasa. Due to the climate, air conditioning isn’t a luxury here! No Mombasa travel guide is complete without a slight warning for Mombasa’s hot and humid climate - it will descend upon you like a hot towel once you leave your plane. There are 2 dry and 2 rainy seasons each year. Read more on my separate Mombasa weather page.